Trade shows and conferences can be a great way to generate leads and increase awareness of your products, services, and brand. They can also be a massive waste of time and money. The latter usually occurs when you fail to attract people to your stand, don’t get them to stay long enough, or don’t give them a compelling enough reason to either make a purchase or give you their contact information. There are two innovative and really cool ways that e-learning can help you achieve these objectives. 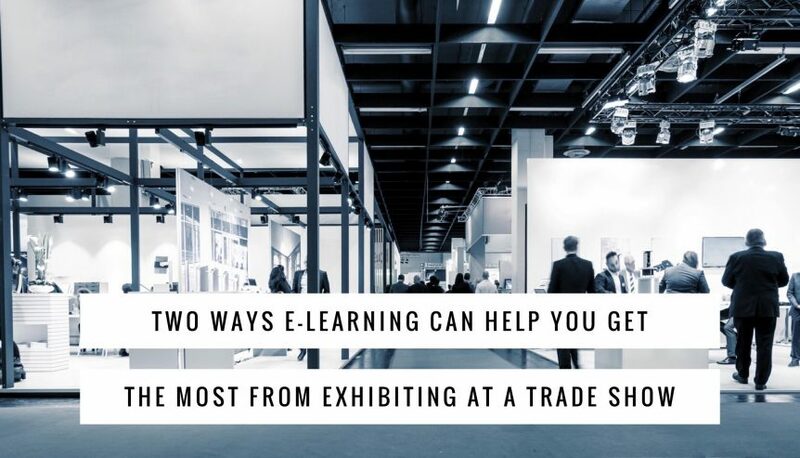 They won’t both work for all companies or industries but there are many situations where you can use e-learning courses to maximise the results you get from spending time and money exhibiting at a trade show. How your staff deal with the experience of being at a trade show as well as how they deal with the people they talk to can be the difference between success and failure. Just think about how many trade show stands you have seen where the people manning the stand are sitting at the back looking at their phones. They do this while hundreds and possibly thousands of potential customers stream by. The team you send to trade shows need to understand how to present themselves professionally, particularly given the long hours of often tedious repetition. In addition, they must be able to make your business stand out from the hundreds of others at the event. Your team must also understand the best approach to achieve your objective – getting sales or generating leads are two of the most common objectives to have. Also, you must ensure your team uses best practice in the days and weeks after the show to ensure they follow up with all leads. After all, there is no point spending effort and resources going to the trade show and then being ineffective once the team is back in the office. A well-structured e-learning course will help you deliver this training to anyone manning your stands at trade shows. You can even use e-learning to train remote teams attending trade shows in countries or regions away from your main area of operations. Have you seen stands at trade shows that nobody is interested in while the stand right beside it appears to be constantly full? To avoid your stand being ignored you must give the trade show’s attendees a compelling reason to come. There are lots of ways you can do this, including through e-learning. It must be short – super short. The shorter the better, in fact. Plus, you must make it clear how short the course is in your promotional signage and material. It should not have a marketing or sales focus. It should be as creative, cool, and interesting as possible. This can mean thinking out of the box for ideas that are only indirectly linked to your company. The course should be professionally designed with features like gamification, avatars, video, scenarios, and more. After all, the course will be the first impression people have of your company, so you must get it right. It should be interactive with more doing than reading. It should have a lead generation hook at the end offering something additional in exchange for contact details. Attending a trade show can be rewarding for your business but only if you get sales. E-learning strategies are not the only option you have available, but they can help make your trade show appearances a success.